Henry Jekyll was a brilliant doctor, a passionate idealist who aimed to free mankind of selfishness and vice. He's also the man who carelessly created a race of monsters. Once shared secretly among the good doctor's inner circle, the Hyde drug was smuggled into mass-production-but in pill form, it corrupted its users at the genetic level, leaving them liable to transform without warning. A quarter of the population are now clandestine killers-ticking bombs that could detonate at any given moment. It's 1903, and London has been quarantined for thirteen years. 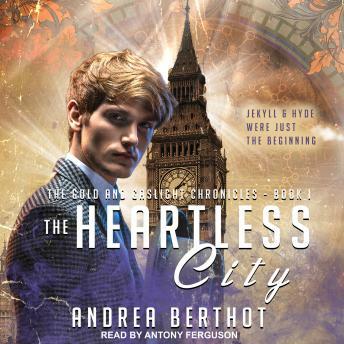 Son of the city's most prominent physician and cure-seeker, seventeen-year-old Elliot Morrissey has had his own devastating brush with science, downing a potion meant to remove his human weaknesses and strengthen him against the Hydes-and finding instead he's become an empath, leveled by the emotions of a dying city. He finds an unlikely ally in Iris Faye, a waitress at one of the city's rowdier music halls, whose emotions nearly blind him; her fearlessness is a beacon in a city rife with terror. Iris, however, is more than what she seems, and reveals a mission to bring down the establishment that has crippled the people of London.